All of the Cerberus Fossae elongated trenches on the Elysium plain run in the same direction: from north-west to south-east. At the centre of the image we see the two most conspicuous trenches: further to the south (left on the picture; where north is to the right) we can also see two additional, narrow trenches. The forces, which culminated in the crust breakup, acted perpendicularly to this. The smooth areas consist of solidified, low viscosity lava. The small number of impact craters on its surface shows that the volcanic eruptions took place in the recent geological past. If we zoom into the picture, we can see many places where the lava flow front ran and where it left its mark on topographical ‘obstacles’. Lava also made its way out from the Fossae to the surface, and at times possibly also water. Credit: ESA/DLR/FU Berlin, CC BY-SA 3.0 IGO. The landscape in the Cerberus Fossae region looks as though it has been sliced through with a knife. The tectonic fissure structures were created less than 100 million years ago, and possibly even less than 10 million years ago. This is also apparent from the profile of the Fossae, which are confined by extremely steep and in some cases almost perpendicular walls, which in some places are more than 500 metres high. If, in a distant future, astronauts drove their Mars vehicles over the Elysium plain on a survey, travelling north eastwards to the Elysium Mons and Alba Patera volcanoes, standing at the edge of the Cerberus Fossae, they would have a similar experience as the Spanish pioneer García López de Cárdenas. In the year 1540 – as the first European to do so – he gazed in astonishment at the view from the edge of the Grand Canyon. Like him, the astronauts would have to choose between retracing their route or making a major detour. The walls of the Cerberus Fossae are extremely steep, almost perpendicular in places, and can be more than 500 metres high locally. They were created as the result of expansion in the Martian crust, in the form of tectonic fractures, through which magma was able to rise to the surface and to flood the plains with a thin layer of lava. 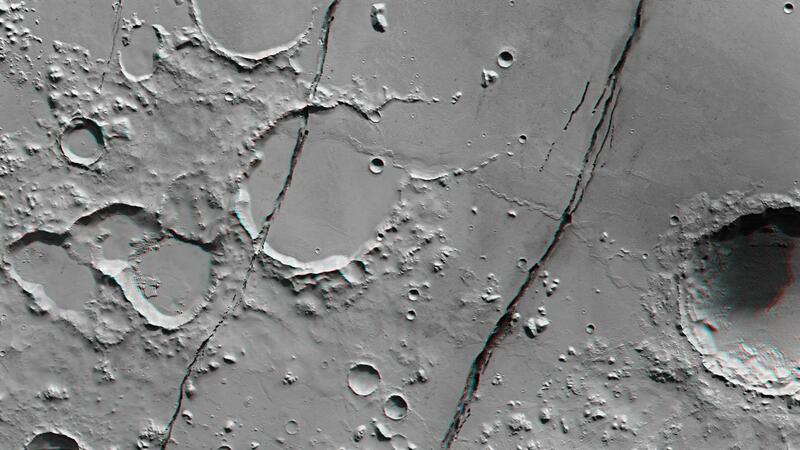 Anaglyph images are produced using the data acquired by the nadir channel of the Mars Express High Resolution Stereo Camera (HRSC), the field of view of which is aligned perpendicular to the surface of Mars, and one of the four obliquely angled stereo channels. Anaglyphs create a realistic, three-dimensional impression of the landscape when viewed through red/blue or red/green glasses. This makes it easy to see that the numerous craters in the centre of the image, which originally would have had a bowl-shape, have been flooded by thin lava and sometimes filled almost to their edges with volcanic deposits. By contrast, the large crater at the right hand (northern) edge of the image, which is approximately 30 kilometres wide, has a formidable crater rim which would have prevented the lava from the flood to flow into the inside of the crater, which is approximately 2500 metres deep. Using the zoom function we can examine the Cerberus Fossae rift valley, whose width exceeds one kilometre in just a few places. On the Elysium Plain, Elysium Mons and Albor Tholus are two major volcanoes which are thought to have remained active until Mars’ recent geological past. Consequently, in the wider area around these volcanoes, there are many signs of tectonic activity such as extensional faults that include the Cerberus Fossae. In the course of orbit 17813, the HRSC camera system on board ESA’s Mars Express spacecraft acquired the strips of photographs featured here, and the region for the pictures shown in this release can be seen in the box. 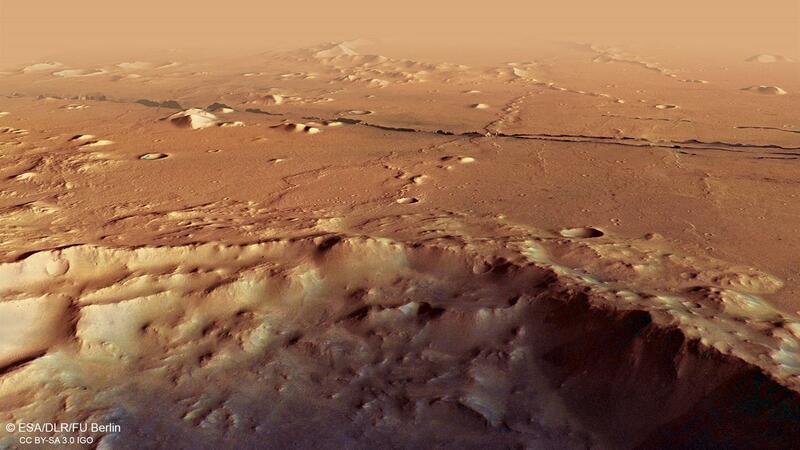 The strips of photographs taken, from various angles, by the HRSC camera system aboard Mars Express, provided the basis for computing digital terrain models for the surface of Mars, including elevation models for each area of the photographs. The colour-coded topographic view (5) is based on a digital terrain model (DTM) of the region, from which the topography of the landscape can be derived. The reference body for the HRSC-DTM is a Mars equipotential surface (Areoid). Differences in elevation are easily distinguished, thanks to the digital terrain model’s colour coding: the lowest elevation area, in a large crater which is approximately 30 kilometres wide, is located 5500 metres below the Areoid, and the regions shown in red, at -3000 metres, are located at least 2.5 kilometres higher. The Cerberus Fossae are up to 500 m deep. Volcanism often goes hand in hand with tectonic shifts in the rock crust on all terrestrial planets and the Moon. Magma bubbles rise up from the planet's interior, making room as they ascend and pour their molten rock over the planet's surface in the form of lava. The emptied magma chambers create cavities, which can cause the rigid masses of rock of the crust to sag and shift. Depending on their nature, these tectonic movements on the planet's surface can be defined as thrust faults, in the case of contractions, and as extensional faults, in the case of stretching. 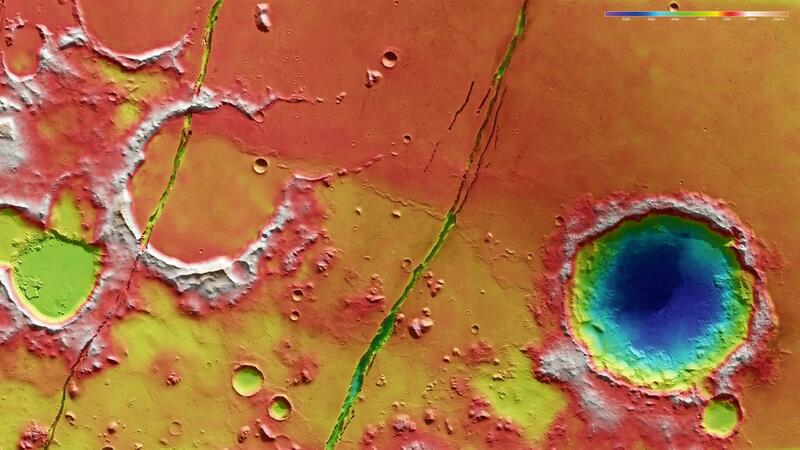 The latter is the most common form of tectonics on Mars. The Cerberus Fossae are two parallel extensional faults that run almost 1000 kilometres across a young volcanic plain in the Elysium Planitia region. The High Resolution Stereo Camera (HRSC) system, developed by the German Aerospace Center (Deutsches Zentrum für Luft- und Raumfahrt; DLR) and operated on board the ESA Mars Express spacecraft, photographed these striking rifts in January 2018. Systematic processing of the camera data was carried out at the DLR Institute of Planetary Research in Berlin-Adlershof. The Cerberus Fossae – Latin for 'Rifts of Cerberus', the multi-headed 'hellhound', who guards the gates of the underworld in Greek mythology – are particularly striking tectonic fissures. The two trenches run almost exactly parallel to one another and stretch from northwest to southeast. They are extremely steep-sided throughout and in some places cut almost vertically down through the layers of lava. This is an indication that the trenches are still very young, as over time erosion causes rock to break off from steep slopes and edges, so that the gradient of the slopes become increasingly shallow. The few impact craters on the volcanic plain also indicate that the landscape here cannot be very old. The age of the lava flows can be determined quite by counting all of the craters and measuring their various diameters, and comparing this with other areas of Mars. This method of determining the age of geological surfaces can be applied to all bodies in the Solar System that have a solid surface. Scientists therefore assume that parts of this plain were flooded with low viscosity lava in the recent geological past, possibly even less than 100 million years ago. Lava also rose to the surface out of the Cerberus Fossae (and later presumably so did groundwater). 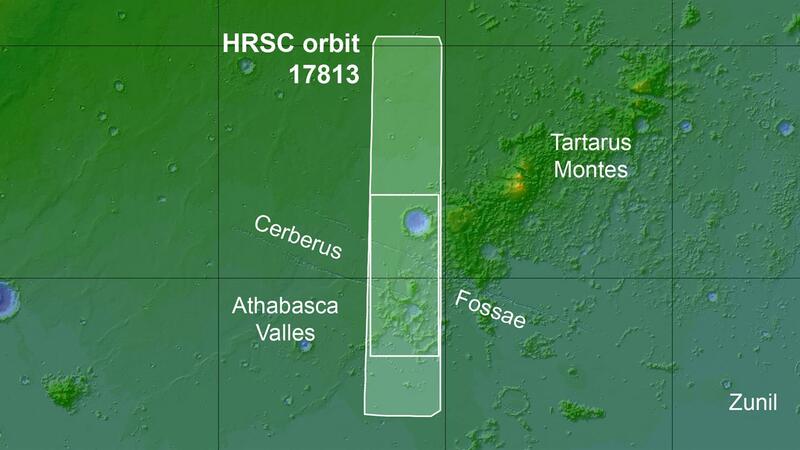 This makes the near-Equator region of the Cerberus Fossae one of the youngest geological structures on Mars. 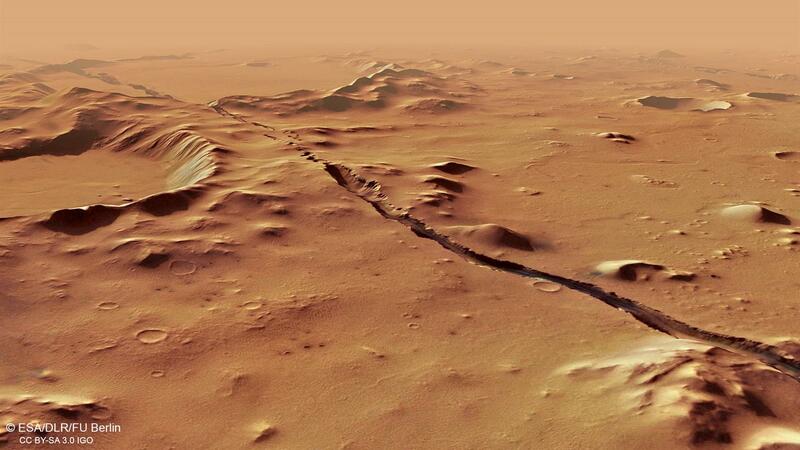 Although neither Mars Express nor the numerous space probes that have observed the planet from orbit have discovered any signs of volcanic activity, scientists believe that tectonic movements are occurring within the Martian crust. The Seismic Experiment for Interior Structure (SEIS) developed by the French Space Agency (CNES) was launched aboard the NASA InSight space probe on 6 May 2018 for the purpose of recording Marsquakes. InSight will land a few hundred kilometres to the west – still on the Elysium Plain – on 26 November 2018, and will start recording Marsquakes around the turn of the year. The aim is to investigate the state and structure of the Martian interior. Also on board InSight is the HP3 (Heat Flow and Physical Properties Package), an experiment developed by DLR, designed to measure the flow of heat from the core and mantle to the surface of Mars, in order to draw conclusions about the state and development of Mars’ metallic core. The Cerberus Fossae are tectonic features originating most likely from dilational faulting or from subsidence due to dike emplacement. Rounded collapse pits observed in the northern Cerberus Fossae indicate an early stage of graben subsidence, and are particularly evident in the northern part of the Cerberus Fossae. Besides, numerous volcanic dikes formed in the Martian past in the north-western volcanic region of Elysium, which is home to the 12.5 kilometre-high volcano Elysium Mons. Dike emplacement induces deformation and can lead to the formation of fissures and graben at the surface above the dike. The outflow channel system Athabasca Valles (see image 6), which rises in the Cerberus Fossae can bee seen to the west of the image shown here. 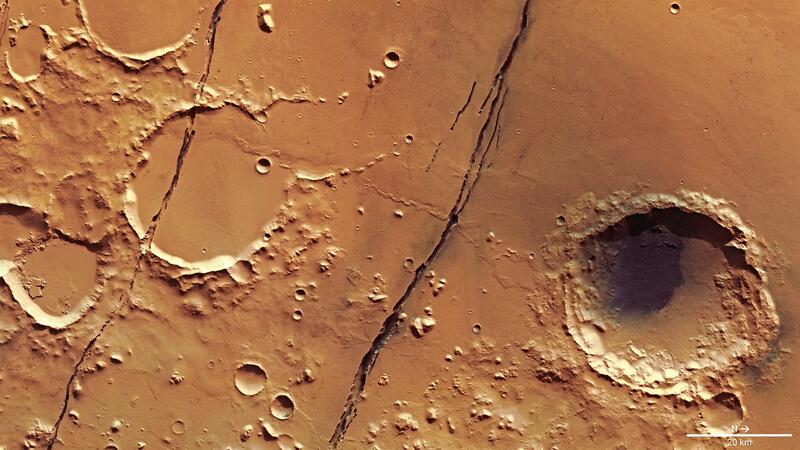 Presumably, the Cerberus Fossae fissures have ruptured the Martian crust millions of years ago to a certain depth, to be able to discharge lava from a volcanic source as well as groundwater. The dark material within the Cerberus Fossae and on the floor of the unnamed impact crater were carried here by winds and formed dunes made of dark sand. Dark dunes are very common on the surface of Mars and consist of old volcanic ash. The images were acquired by the HRSC (High Resolution Stereo Camera) on 27 January 2018 during Mars Express Orbit 17813. The ground resolution is approximately 16 metres per pixel and the images are centred at about 159 degrees East and 10 degrees North. The colour image (Image 1) was created using data from the nadir channel, the field of view which is aligned perpendicular to the surface of Mars, and the colour channels of the HRSC. The oblique perspective views (Images 2 and 3) were generated using data from the HRSC stereo channels. The anaglyph (Image 4), which provides a three-dimensional view of the landscape when viewed using red-green or red-blue glasses, was derived from data acquired by the nadir channel and the stereo channels. The colour-coded topographic view is based on a digital terrain model (DTM) of the region, from which the topography of the landscape can be derived. The reference body for the HRSC-DTM is a Mars sphere. The High Resolution Stereo Camera was developed at the German Aerospace Center (Deutsches Zentrum für Luft- und Raumfahrt; DLR) and built in collaboration with partners in industry (EADS Astrium, Lewicki Microelectronic GmbH and Jena-Optronik GmbH). The science team, which is headed by Principal Investigator (PI) Ralf Jaumann, consists of 52 co-investigators from 34 institutions and 11 countries. The camera is operated by the DLR Institute of Planetary Research in Berlin-Adlershof.